Fuba Communications Systems GmbH (FCS) is a leading European manufacturer of high quality cable television equipment, based in Germany. For over 40 years, FCS has enjoyed a leadership role in the development and manufacture of communications products, beginning with antennas, and rapidly moving into cable television, master antenna television (MATV) and satellite master antenna television (SMATV). Within the cable industry in Germany and elsewhere in Europe, FCS has earned an outstanding reputation as a provider of high quality equipment as well as a general contractor, managing turnkey newbuild cable television projects. In 1998 Fuba was aquired by General Instrument Corporation (GI). 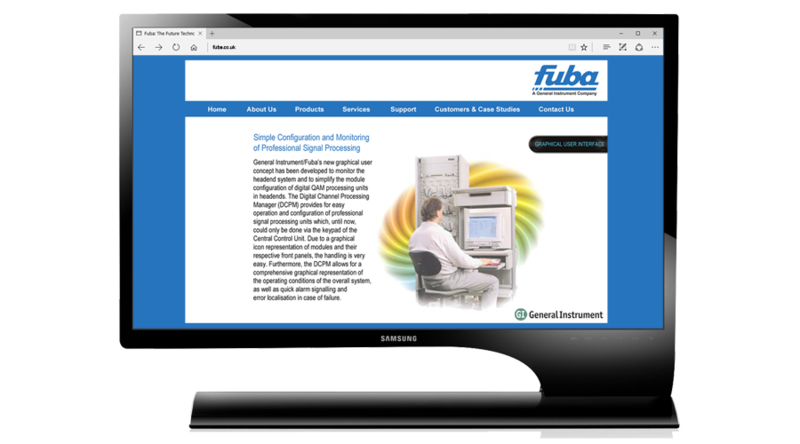 On their aquisition of Fuba Communications Systems GmbH (FCS), General Instrument Corporation in the US approached InForm to design and develop a European website for this leading German Cable & Satellite TV equipment manufacturer. At the time, we had just launched a website for General Instrument Europe which had received excellent reviews in the Cable and Satellite Industry press. The aim of the site was to integrate the GI Branding into the European Fuba site. The site was hand coded in HTML and had five language variants (English, German, French, Spanish and Italian). InForm Web Design have integrated seamlessly with our European Marketing team. They have worked to a very tight deadline and delivered a quality website that fully meets our business objectives.